A dose of reality. There are a couple of sides to Raheem Sterling. First, there’s the footballer: young, exciting, brimming with potential and sometimes electrifying. He enjoyed enough first team playing time when he burst onto the scene to make us forget just how young he really is even a year on from the building of this list. Second, there’s Raheem Sterling the man: teenage father, persistent frequenter of barbershops and collector of luxury shoes and trainers. Despite his modest years, Sterling’s extracurricular activities and occasional fleeting interest from the authorities are lore. Common distractions for a young man, perhaps, but unwanted distractions too. Jamaica-born Sterling exists somewhere around the intersection where hype meets trouble, but the important thing for him is to focus on his football. Since a thigh injury in April he’s found opportunities to do so hard to come by, picking up just one start and a shade over 200 minutes of Premier League action this season. Last time out, he started exactly half of the 38 league matches; 17 of those were in the first 20 games of the season. Though he is trying to add something more than dribbling to his game, there’s no secret in Sterling’s style and it’s not an approach that particularly adds to the way Liverpool have taken to playing under Brendan Rodgers. The teenager is the kind of player who is fouled a lot, a winger who is quick and tricky but painfully one-footed, rendering him limited when playing on the left, where a poor final ball or necessity to turn out and start again tends to slow the tempo that Sterling’s own liveliness helps to create. 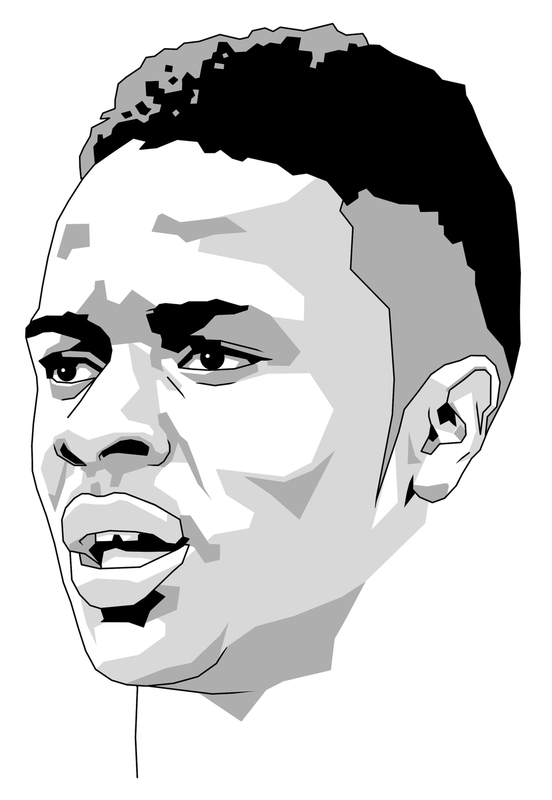 Sterling is a vibrant dribbler and generates excitement and opportunities as a result. He drops a shoulder well to beat a man, and his pace and balance can be lethal. Occasional wastefulness in possession shows that he’s not quite the finished article; in fact, he’s some way off it. And, at 18, why wouldn’t he be? Sterling’s lack of football has caused alarm in some quarters and his inability to stand out for the England Under-21s, a team with some excellent prospects but only a couple with Sterling’s public profile, blamed on a bit of ring rust. Talk of a loan move to Swansea City or Derby County has bubbled away this autumn, but Rodgers has insisted that Sterling has a future at Anfield. There should be no surprise that Sterling’s 2013 has been a more fractured, less explosive year than his 2012. He is 18 years of age and a headline-grabbing start to his career doesn’t change the fact that he will play in patches for a long while yet before becoming a consistent, match-winning influence. Fulfilling his eye-catching potential in the years to come is up to him and him alone, because he has the tools. In addition to targeting a place at the World Cup – and, in all honesty, any place in the England squad would result more from his being capped already than his input this season – Sterling faces a dual challenge. First, he must continue to mature and settle into his game without succumbing to the over-exposure that can affect young players in the spotlight. Second, he needs to start to make more of an impact when he does play. Sterling, while thrilling at times and certainly a player to watch when he’s in full flow, dips out of games too readily. If he keeps himself focused on football that will happen less often as he gets older, because the quality is there in bundles. That focus remains the dominant question mark. Liverpool boss Rodgers said that, “Football has to be very much at the forefront of his mind. If it is, he is a talent.” The real message in that bland soundbite is in what it doesn’t say more than what it does. Perhaps related to that, Rodgers is wary of burning Sterling out and is keen to keep his young player’s feet on the ground in the face of quite ridiculous expectations at club and country levels. Sterling will benefit from a spell out of the limelight, but he could do with some football too. If Liverpool continue to play without traditional wingers and use Sterling only as a substitute – or not at all – then perhaps that loan move would benefit both him and Liverpool. Less talk, more football, better end product; Sterling’s 2014 shouldn’t be too complicated an affair.